2018 EGGS Fire 12U MDE Explosion Tournament Champions! 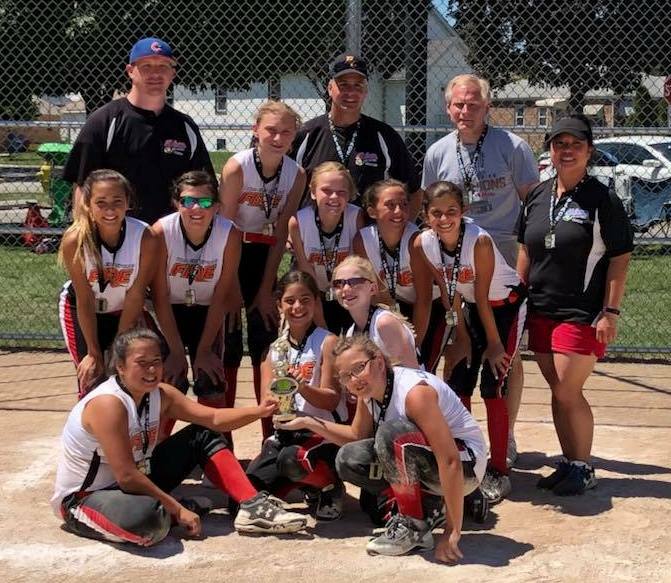 The Elk Grove Girls Softball Fire Team is a tournament team that consists of non-travel players. Girls tryout for the team designated for their age level and if selected, compete in three to four tournaments after the regular house season ends (mostly in July and/or early August). Contact Nick Moser at eggscommissioner@gmail.com for more information. Born on or between 1/1/2004-12/31/2009. See Divisions & Managers for specific division groups. Players that are currently on a travel team are not eligible to play. Managers will be determined in May. Tryouts for the 2019 Elk Grove Fire will be at CAF (Community Athletic Fields). Players will be evaluated and rated on hitting, fielding, base running and if applicable catching and pitching skills. After all tryouts are completed, the selection committee and the team manager will select the best 11-12 players for each team. The final selections for each team will be posted on www.elkgrovegirlssoftball.com. Cost will be around $250, which will include new uniforms and tournament fees (3 to 4 tournaments, mostly in July and/or early August). No one is guaranteed to play any specific position on the team. Playing time is earned and not given. The best lineups will be used to give the team the best chance to win. If you ever have questions about playing time, parents are strongly encouraged to follow the 24 hour rule and wait 24 hours after a game to discuss with the coach. While we understand that some conflicts are unavoidable, we require a commitment from players and their parents to ensure that all players will attend all of our practices and games. Only with everyone's cooperation can we build the kind of depth we need to compete. Absences should be discussed with the individual team coach. Upfront communication is better than surprising the coach at the last minute. While participating in team activities, it is expected that players give 100% effort to improve themselves as ballplayers. Hustling and a positive attitude are expected traits of any EGGS player. Players are expected to be positive, enthusiastic and committed to individual and team development.